The last few weeks I have been on a mexican food kick like no other. So brace yourself for all the goodness that will be coming your way soon. I realized after the fact that the timing works out perfectly for Cinco de Mayo, which is rapidly approaching. I wish I could say I planned it that way but I didn’t. Although maybe I shouldn’t have just told you that … so I would have looked like I was all over it. But let’s talk about the first dish in the lineup I have for you over the next few weeks. 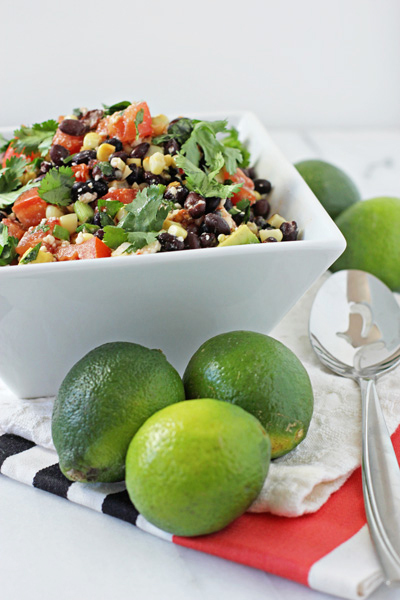 Southwestern black bean salad. It may not sound like much, but I promise that this side dish is worth making. 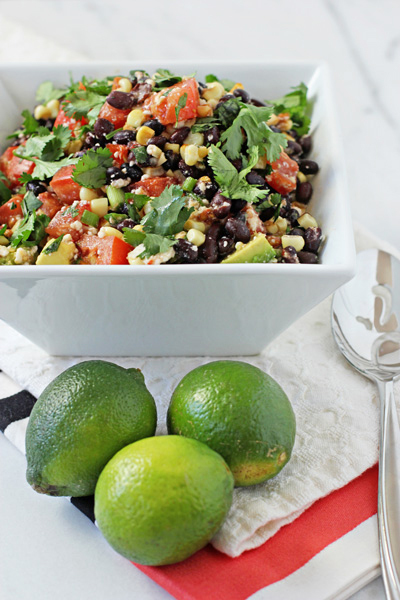 It is filling and full of some of my favorites – like corn, tomato and of course avocado. And the dressing? Amazing. Lime, honey and chipotle join forces to make this salad even more irresistible. 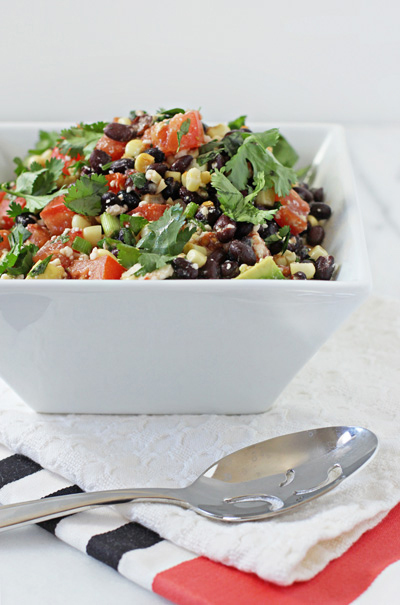 So go fill your belly with this southwestern black bean salad. It will be happy you did. And then check back soon … we’re just getting started. 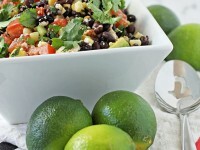 Recipe for southwestern black bean salad. Filled with beans, corn, tomatoes, green onions and cilantro. Topped with a honey lime chipotle dressing. Place a medium skillet over medium heat. Add in 1 tablespoon of the olive oil. When hot, add in the corn and cook for 6 to 8 minutes, until golden brown. Transfer to a large bowl. Add in the beans, tomato, cilantro and queso fresco. Toss to combine. Add the avocado to the bowl and fold gently to incorporate. Season with additional salt and/or pepper to taste, if desired. 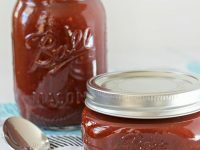 I wouldn’t suggest substituting frozen or canned corn in this recipe – the taste won’t be quite the same! *The salad can be prepared up to this point two days in advance. Store in the refrigerator in an airtight container. Slightly adapted from America’s Test Kitchen Healthy Family Cookbook. Hi Ashley! Hope all is well and that you’re settling nicely into your new home in NC. I made this salad on Sunday and thought of you – it’s fabulous! I am headed to DC this weekend, any must-eat places that you’d recommend? Tried this with grilled chicken and guacamole on the side (instead of avocado in the salad). Fabulous! Oooo that’s a great idea! So glad you enjoyed it! This looks like all kinds of awesome. All my favs in one bowl! 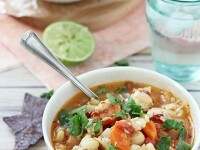 Oh, please send me a huge bowl of this for lunch tomorrow! It looks so light and tasty! YUM. This is pretty much the perfect lunch, in my opinion. 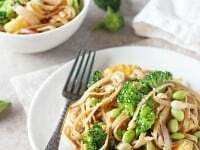 Spicy, full of protein and veggies–what’s not to love?! Absolutely love this! I wish I had a big bowl of this for lunch! I’ve been on a Mexican food kick myself, and my mouth was watering just reading the ingredients. 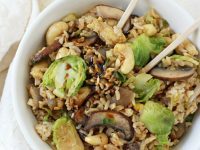 The dressing sounds heavenly…I’ll be making this! I’ll quite possibly have a very limey pomegranate margarita with it! A pomegranate margarita sounds perfect to go with this! I love black bean salads! You seriously cannot go wrong with avocado. Looks so fresh and colourful! Agreed – avocado is always a good thing! I love black bean salads! I think this needs to be lunch asap. There are few things I crave as much as Mexican flavors, but I love these lighter preparations. That dressing sounds fantastic! I just cooked with chipotles in adobo over the weekend, and love that smokiness. The dressing is pretty awesome : ) I’ve been using chipotles a lot too lately … agree with you on the smokiness!